Maps by NOAA Climate.gov, based on data from the Climate Prediction Center. 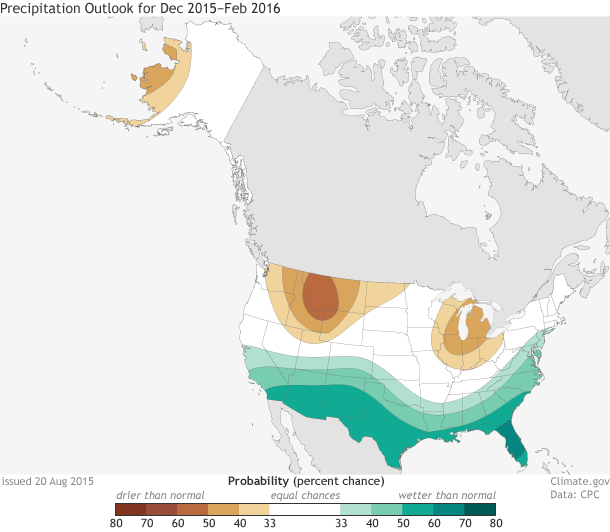 Chances of possible temperature (upper map) and precipitation (lower) outcomes for December 2015-February 2016: above normal, below normal, or near normal. Above or below normal means temperatures in the upper or lower third of the range of historical temperatures. White does not mean "near normal;" it show places where the chances for above-, below-, and near-normal temperatures are equal. The Bay Area needs to receive more than 190% of its typical precipitation in order to be considered out of its drought. In this case, out of the drought means out of the bottom 20% of all five-year periods in the historical record. 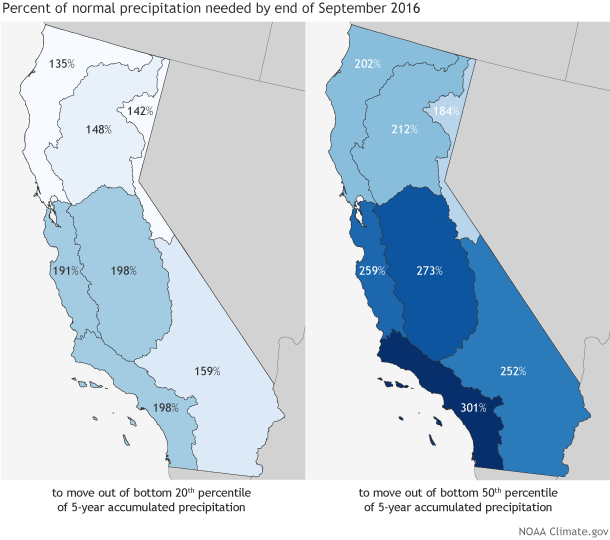 And the odds don’t favor higher-than-nornal precipitation in northern California. Also, there is only a 33% to 40% chance that winter will be wetter than normal this year, because El Niño is experienced much more strongly in southern California than in the middle of the state. The probability may be even lower than that, because the Bay Area is on the edge of that probability zone. The jury is still out, though, on northern California. In the past, the connection between wet winters and El Niño has been less reliable in the northern part of the state than the southern part. But according to a new analysis by the NOAA Drought Task Force, the odds for a wet winter across the entire state improve the stronger the El Niño event is, and the 2015-16 event is currently forecast to remain strong through winter. There’s a lot more information in the linked article.